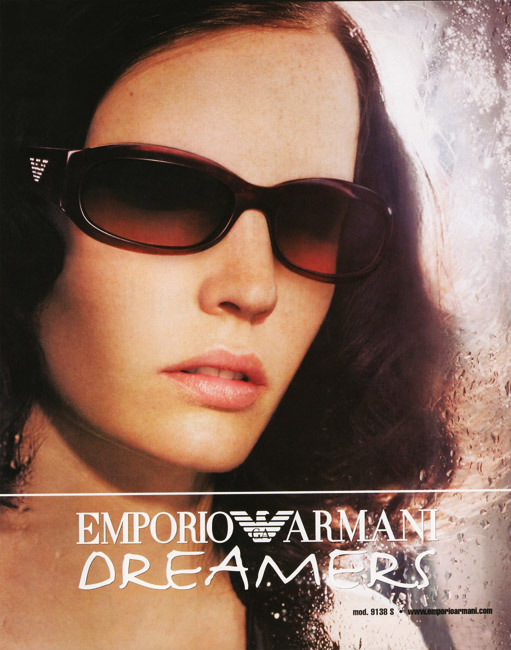 Actress Eva Green wore these Emporio Armani 9138 sunglasses in the 2004-2005 Emporio Armani Dreamers ad campaign. Eva Green starred together with Michael Pitt and Louis Garrel in the Bernardo Bertolucci film The Dreamers and they were the ambassadors of Emporio Armani in 2004-2005. Vincent Peters shot the images for the campaign in Paris, the city of The Dreamers. The media project included fashion and lifestyle magazines, daily papers and posters. The first images appeared in July 2004. In the campaign images Eva Green wears models EA 9131, EA 9138/s, EA 9145/S and EA 9158/S while Michael Pitt wears models EA 9153/S and EA 9123. These sunglasses have been discontinued by the manufacturer, but can still be found regularly and in different colors on eBay.